New Delhi:(Page3 News Network)-Mr. Bal Gosal, Minister for Sports, Canada called on Shri Jitendra Singh Minister of State (I/C) for Youth Affairs & Sports here today. Mr. Gosal currently visiting India as a part of Canadian Prime Minister delegation. During half an hour discussion, both Ministers exchanged the ideas for identifying areas of cooperation between the two countries. While briefing the media, after the meeting , Sh Jitendra Singh said “we exchanged the several ideas for developing cooperation in sports.” He said that Canada can help India in the field of sports medicine and establishing infrastructure for Winter Sports. 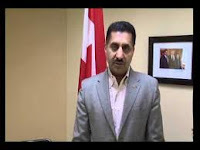 Mr. Gosal said that bilateral relations of India and Canada are extremely good and Canada is always willing to help India in extending cooperation in setting up Winter sports facilities. He lauded the India’s athletes performance at recently held Summer Olympics at London Where India athletes won six medals. He also appreciate the ideas of funding of sports activities through creation of National Sports Development Fund (NSDF) in Public & Private Sector Participation by the Sports Ministry .